As the weather heats up, spending time outdoors becomes less about keeping warm than keeping the party hot. 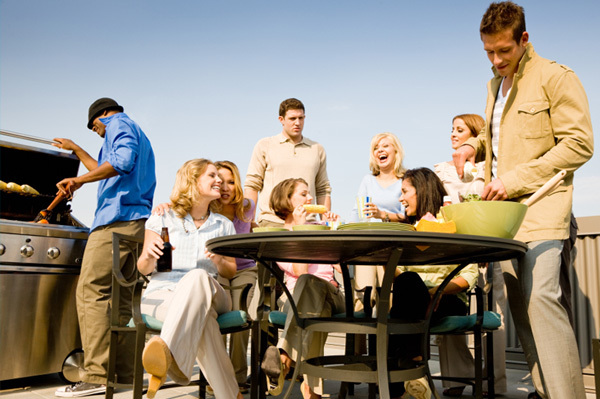 Outdoor barbecues are a great way to get your social circle buzzing again, but you have to be prepared. Here are the seven barbecue party must-haves that will get your soiree sizzling. A plain piece of meat is pretty boring, but if you throw a marinated version on a skewer, suddenly meat is bite-sized and fun. Go veg with baby potatoes, carrots, tomatoes, peppers, onions and more, or try marinating tofu in your favorite dressing or sauce. Skewers are a fantastic way to present healthy, fresh food in a unique and jazzy way. Super-bright, printed dishes are a great way to bring color to your party and are available at most grocery and big-box stores. They’re washed and stored like ceramic ones, but they’re virtually indestructible — perfect for kids and clumsy adults. As the sun sets, set the mood with customized outdoor lighting. Instead of throwing on the floodlight, invest in reuseable laterns or tiki torches. Their flames create a pretty, soft light that will make guests feel relaxed and carefree. Cloth or paper napkins are absolutely essential at a barbecue, especially if you’re dealing with thick, heavy sauces. Go the extra-clean route with wet wipes, which you can buy individually packaged or in a large, baby-specific container. Either way, it keeps grimy paws off the rest of your finely-tailored party details. Classic barbecue sauce is great, but consider making your own or adding extra-spicy, teriyaki or Thai flavors to the mix. It will leave your guests with a lasting impression that you go the extra mile, even if all you did was buy that extra bottle of sauce at the grocery store. Stainless steel, heat-resistant tools are the best way to go when barbecuing. Make sure you have a spatula, tongs and other grill-appropriate tools on hand to make sure your get-together goes flawlessly. If you invite 25 guests and have only one table, your partygoers will be left to eat and socialize on their feet. Bring out the camping-style benches or even standard plastic patio chairs. Jazz them up with tablecloths, chair pads and other decorations.